Gen. John Hyten, commander of U.S. Strategic Command, speaks at the 2017 Halifax International Security Forum. Hyten: “We are going to go down a different path. 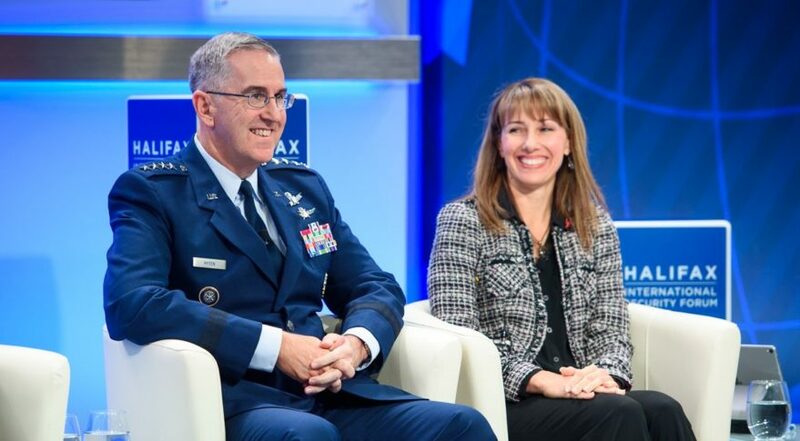 And we have to go down that path quickly"
One problem that needs fixing is how the Pentagon procures satellites, Hyten said. The Air Force spends too much money and time developing large satellites that make attractive targets, he said. “We have huge capacity in space right now that pretty much overwhelms anybody.” But he worries that the military may not be able to defend those assets. People often interpret his statements to mean “I want a Battlestar Galactica” that can defend itself, but that is not what he’s talking about. “You can’t afford to do that. You can’t put all the weight in space to do that.” He would favor constellations of cheaper, smaller satellites that would be harder to take down and easier to reconstitute. Hyten’s criticism of the military’s satellite acquisitions echoes comments made last week by Fred Kennedy, director of the Defense Advanced Research Projects Agency’s tactical technology office. He called on the Defense Department to embrace faster-paced developments and use of commercial technology like small satellites that can be launched quickly and replaced if attacked.